In 2011 the city diverted about 44 per cent of household waste from landfills through recycling and other programs. 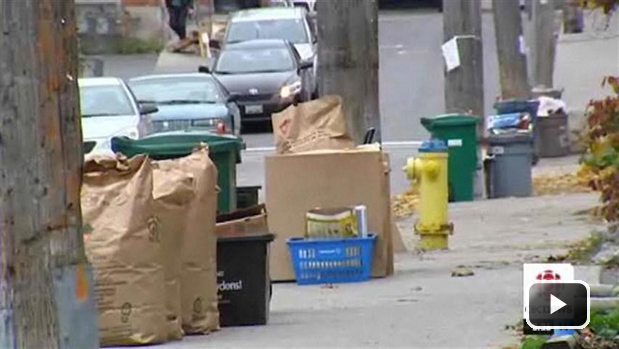 The decision to switch to bi-weekly garbage pickup is expected to increase the diversion rate to 53 per cent by the end of 2013. Families with diapers or incontinence products can sign up for a collection service on off weeks. Putting out 6 bags of trash every two weeks is going to require some getting used to, but the effort is designed to get people to think about a lot of the recyclable material they throw away, and to encourage use of the compost bin – which is still on a weekly basis. The city’s website also includes a useful element called the waste explorer. You can check it out here. It’s designed to help residents identify what goes where in their trash and recycle containers. What do you think of the new weekly garbage pickup?